Writing a book that is enjoyable for others is a tough task for anyone. Write a book focussed narrowly on personal finance and you have an even tougher task. 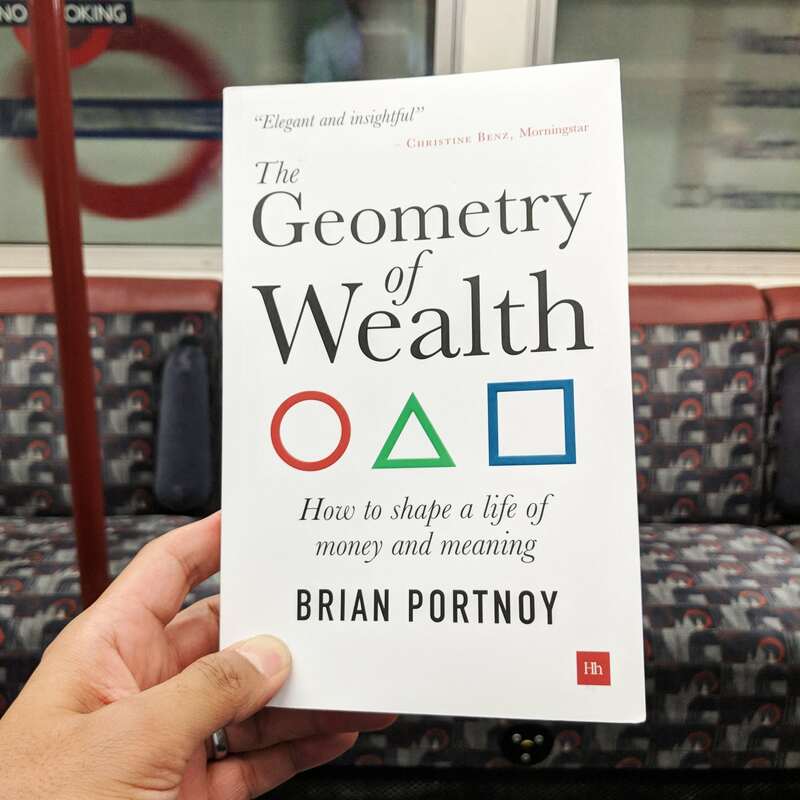 For Dr Brian Portnoy to succeed in doing so with his most recent release ‘The Geometry of Wealth’ is a significant achievement indeed. 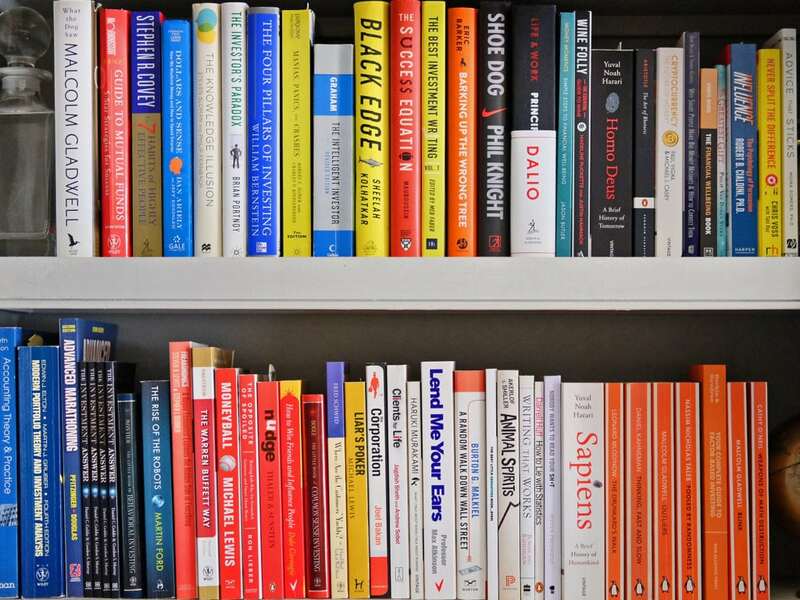 Having read more than my fair share of personal finance books (part of my own bookshelf is on the cover photo) I’ve found that most of them tend to focus on one distinct piece of the overall personal finance puzzle. Some are based on history, some on a successful investor like Warren Buffet, some on a key financial concept like value investing. But in general, you can categorise most finance books into three key disciplines, investing (technical), behaviour (emotional) and planning (coaching). Investing can cover anything from strategy to specific investments, behaviour takes a close look at human foibles and the psychology of money and planning lays out the support system for building towards a financial goal. On the other hand, ‘The Geometry of Wealth’ is one of the very few books I’ve read, successfully bringing all of the pieces together to create a one-stop, all-encompassing guide to money. No need to read multiple books (unless like me you enjoy it!) when one book is enough to cover it all in sufficient depth to gain a good working knowledge. I’m always on the lookout for a book I can comfortably share with friends and clients without scaring them with boredom. One that strips away the complexity of finance to relay the ethos of financial planning and money management that we at Bunker Riley practice. One that the reader can relate to and make use of, without having had any previous financial experience. But it’s rare to find one that doesn’t descend into overly technical and complex analysis and on that basis, I’m thrilled to find that this book hits the right balance. Personal finance has historically focussed on the very technical process of choosing and managing investments and as a result, many individuals and advisors alike have mistakenly concentrated solely on trying to find the perfect investment portfolio. However, in his seminal book ‘Thinking Fast & Slow’ Nobel Prize winner Dr Daniel Kahneman documented decades of his own work exploring the impact of psychology on investor outcomes and the realisation that the human brain often tricks us into making suboptimal and often wildly irrational decisions. We’re human after all, not robots, so it’s well documented for example that most investors buy only after seeing the stock market rise and sell after seeing it fall. That is completely counter-intuitive to most financial goals and where else in life would you purposely buy something only after the price has gone up, rather than when it goes on sale? Therefore, the relatively new field of ‘behavioural economics’ has become an increasingly influential part of the personal finance process. So where does ‘The Geometry of Wealth’ fit into this. Well, most of the clients at Bunker Riley Financial Planning are on some sort of a personal and/or financial journey. Many come to us initially with a specific money or investment problem, but deep down it’s not about getting rich, it’s about making sure there is ‘enough’ to live a financially worry-free, happy and content life. Add our financial planning to the investment and behaviour fields of personal finance and you get a trifecta of disciplines which constitute the full range of advisory services most clients need, whether they know it at the outset or not. ‘The Geometry of Wealth’ posits that true wealth (as opposed to becoming rich) is the ability to fund happiness and contentment and that the ability to underwrite a meaningful life is achievable by anyone who combines the right mindset and the right plan. Financial independence is not the preserve of the so-called rich and anyone that seeks riches often finds that if they ever get there it ends up being a never-ending quest for more. In the book Dr Portnoy uses a circle to demonstrate one’s purpose in life by connecting money to happiness, a triangle to demonstrate one’s priorities by organising our money lives, and a square to demonstrate the tactics used to achieve a decent investment outcome. In doing so Dr Portnoy guides us through all stages of the personal finance process. He does so in succinct (less than 200 pages), clear language without drifting into overly technical minutiae, which often accounts for only a fractional amount of an investors success anyway. Getting the basics right is the key. I had the very good fortune to meet Dr Portnoy at a recent conference in Chicago and having spent some time with him there, been enlightened by the book, it’s subject and its delivery, it’s one of a very select number of books that I’d personally recommend to professionals and non-professionals alike. Those who are seeking to improve, organise and bring meaning to theirs and their clients financial lives. If you’re a client of ours and would like to learn ‘how to shape a life of money and meaning’, then do get in touch and I’ll happily send you a copy.